What a night! Plenty of drama, ups and downs and heartbreak/joy. More of the same all weekend? We'll be here. See you there. England are among the teams in action on Friday night - Roy Hodgson's men have the luxury of a dead rubber as they were already through. Germany manager Joachim Low: "It was an unexpected and totally unnecessary defeat. "In the second half we played a bit negligent. Ultimately, we lacked the ultimate consequence and the last pass. And then we make a single mistake and it is a goal." More from Gordon Strachan: "You have to hold your hands up and say well done (to Ireland). We have played against Poland and Ireland and not been beaten. "I am hugely disappointed. After working hard for a year and at the end of the year for something like that to happen in the last seconds of a game...that's a year's work. I can't remember us getting anything lucky. Anything we got has been earned." Scotland manager Gordon Strachan: "If I'm like the rest of the nation, I am hugely disappointed for the players. The group of lads gave as much as they could give. That's what I see at the moment. I feel a bit sorry for them, to have put so much work in and to have scored two wonderful goals. I am proud of them. They have been a bit unfortunate." Dancing in the streets of Harare? Middlesex batsman Balbirnie and his Ireland team-mates begin a one-day international series against Zimbabwe tomorrow. Germany defender Mats Hummels: "What happened is what happens with teams like Ireland and that is that we had a lot of possession. "We had our chances but they used their only one. Ireland made the most out of very little. Now we know it can get very tight in the last game and we have to be dominant against Georgia and not let anything happen." Republic of Ireland boss Martin O'Neill: "The players put in a fantastic effort. To beat the world champions is a sensational effort. "We showed bravery and courage. We had to withstand a lot of pressure, which you'd expect, and we did that. "We have reached the play-offs now and we can go for it on Sunday now." So. Just to de-tangle what surely must be one of the most complicated qualification scenarios in football ever, here's where we are in Group D.
Republic of Ireland and Poland play in Warsaw in both teams' final match on Sunday. A draw would leave both teams on 19 points. Germany currently lead the group on 19 points, but will be expected to beat Georgia at home in their final game. If though, all three teams end up on 19 points, both Poland and Republic of Ireland have better head-to-head records than Germany, and both would finish above them. A 0-0 draw in Warsaw means Poland go through - they will have scored more away goals in meetings between the two sides. A 1-1 draw in Warsaw means Poland go through - they have a better goal difference of the two sides. A draw of 2-2 or higher would mean Republic of Ireland go through - as they will have scored more away goals in meetings between the two sides. Elsewhere, Portugal booked their ticket to Euro 2016 with a 1-0 win over Denmark in Braga. Joao Moutinho scored the only goal of the game midway through the second half as Portugal ensured they would top Group I. Denmark, who have played their last game, will still qualify if Albania fail to win in Armenia on Sunday. Windsor Park is still rocking - there will be a good night out in Belfast tonight. And Dublin for that matter! 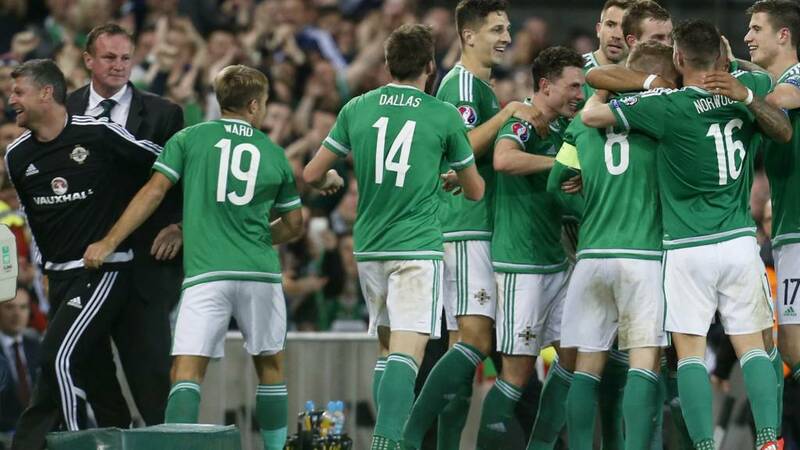 Northern Ireland boss Michael O'Neill: "The players were outstanding. Right through the team, magnificent, It's a privilege to be here, I'm proud to stand here as their manager. "How have we done it? I'm not really sure! The players deserve the ultimate credit. We have confidence and belief which comes from winning games. This shows the potential of this team and of football in Northern Ireland." BBC Scotland reporter Chick Young at Hampden: "Every fan leaving the ground will feel the same. The heart and soul has been ripped from us. This was going to be my final campaign. That's the tin hat on that now. I feel absolutely torn apart and shattered. I won't sleep tonight. People will wonder how on earth that happened. It's always us." Northern Ireland defender Gareth McAuley: "I've had some highs in individual games in my career but there has been real belief in this campaign. "I can't put into words what it means." Scotland's chances are over, they are out of the picture. Steven Davis: "An unbelievable night. We showed what we were all about we couldn't ask for it to go any better." Josh Magennis: "I honestly can't put it into words. It came off my shoulder but I don't care! We have been working on set-pieces all week, they are a big part of how we play. We may not have the best quality but we never give up. Once you have that fight you can be a formidable team." "After a poor first half that started with a Lewandowski goal and finished with a stunning Matt Ritchie equaliser, Scotland took control of proceedings at Hampden and started to believe that it could be their night. "An equally outstanding Steven Fletcher goal just after the hour mark and it was dreamland. But what a cruel and nightmarish ending. That’s it for Scotland - dreams of France are dead and they died once again on the bed of glorious failure. Bring on the World Cup." "I am speechless. I'm just taking it all in. It's unbelievable, Northern Ireland have qualified for Euro 2016. "The music is roaring and the fans are dancing, here at Windsor Park. Tonight Greece just couldn't live with them." "I've seen some incredible things over the years but I don't think i'll ever see anything more extreme than this. Poland have scored with a complete and utter fluke, and Scotland are out." Scotland's Euro 2016 hopes are over. What an end to the game. Drama. What drama! Right at the end! Poland had their goalkeeper up for a free-kick, real kitchen sink job, the ball goes through a ruck of bodies and hits the inside of the post. The ball runs across the line and agonisingly for the Scots Robert Lewandowski is the fastest to react and hooks in on the line. Tremendous scenes at Windsor Park as one of the goalscorers Josh Magennis is at the foot of a pile-on. Northern Ireland were without four key players tonight and they have still got the job done. "The adrenaline should be bursting out of these Scotland players, but it's not - they're looking tired." Into added time in Belfast - what a night! Germany would be through. One of Ireland and Poland has to drop points on Sunday. Your maths is shocking BBC. It (shouldn't) make any difference but Greece have a goal - a carbon copy of Northern Ireland's opener as Christos Aravidis taps in a cross from the right. "After news of Shane Long's goal for the Republic of Ireland broke here the crowd went eerily quiet - I think everyone had got their calculators out trying to work what is going on in terms of the qualification. "On the pitch the players are visibly tiring but they have to hold on. They could also do with Germany equalising against Republic of Ireland, too..."
Oh what a chance! Thomas Muller has made a career of putting these away but he somehow side-foots wide from the penalty spot after a cutback from the left found him in space. What a chance! The Republic are 15 minutes away from a famous, famous win. Good grief. Shohidur Rahman: Scotland, Republic of Ireland and Northern Ireland all winning. Amazing! Chris Davies: What a night of football! Come on ROI and NI! Daniel Woodley: What a phenomenal finish from Shane Long!!! A vital goal for Republic of Ireland! Can they do the unthinkable and hold on? Get involved using #bbcfootball on Twitter, or post on the BBC Sport Facebook page. You can also text us on 81111 from UK mobiles, but don't forget to include your name. "The news of Ireland’s goal against Germany seems to have reached the stands here at Hampden. Looks of disbelief all round as fans rummage in their sporrans for the calculators." Northern Ireland - start booking your tickets. Republic of Ireland - are beating Germany, as it stands a draw in Poland would see them qualify. Scotland - remain in fourth and can still make the play-offs. Oh my word! Shane Long! A ridiculous night continues as the substitute puts the Republic of Ireland in dreamland! It's a goal Jackie Charlton would approve of. Thoroughly. Darren Randolph belts the ball 75 yards downfield, with a bounce, Long reads it and gets there before Jerome Boateng and thumps it into the corner! "Having watched Scotland for so many years there is still such a fear factor. They've conceded late goals in games like these many times before..."
Can you clarify whether positions are decided by goal difference or head to head record if points are the same? If Scotland win both games & Ireland beat Poland, is there a scenario where Ireland qualify automatically & Scotland get into the playoff position in 3rd? You wouldn't imagine there are too manyFaroe Islandsfans-for-the-night left in Windsor Park now Northern Ireland are 3-0 up butHungaryhave equalised against the minnows in Budapest. More importantly though,Finlandhave just taken the lead againstRomania. Meaning as things stands, Northern Ireland willwin their group. Into the last 20 minutes in Glasgow now - don't forget you can follow full coverage of that game here. A goal for the Republic would really blow this group wide open now. There are 28 minutes left in Dublin, where the second half was late restarting. Any chance? "There are two things people from Northern Ireland are famous for and that's passion and parties. At Windsor Park you can see the passion on the pitch and in the stands, and tonight you will see the parties." "That Fletcher goal came just as the Poles were edging back into the second half. fabulous strike from the Sunderland man. Sounds like the roof is coming off Hampden Park. How will the visitors respond? They have looked dangerous throughout this match. Time for calm heads from Scotland." It's all gone very quiet in Dublin. Who would have thought that 0-0 to Germany could be a bad result? Well, if it stays like this in Dublin and Glasgow it might not be - as a win in Poland in their last game would give them automatic qualification. Northern Ireland - are heading to France. Get booking those tickets! Republic of Ireland - currently two points above Scotland and could still secure automatic qualification. Scotland - could still secure a play-off space. Depends on what happens with the Republic. "Absolutely incredible! That is one of the best goals I have ever seen Scotland score! I don't know where to look. Poland have been by far the better team for much of this game but for pure spirit, there is no doubt in my mind. Scotland deserve this." Oh my word! Where has that come from?! Steven Fletcher - hammered almost universally all night on social media - produces possibly the finest finish of his career to lift a 20-yard curler into the top corner! Scotland won the ball back in midfield and one pass found him on the edge of the box, but it was a brilliant strike! "Unbelievable... Blimey. I think we're definitely going now you know." "Scotland look a side with more bite and belief in this second half. The wide men are stretching the game and Scott Brown is also starting to drive from the middle of the park the way he does for Celtic. The Poles still look dangerous though and fancy their chances when they come forward." Luke: Northern Ireland. England cheering with you. Welcome to the party. What a goal! Stephen Kennedy: I once said Josh Magennis has a touch like a bouncy castle. I now retract that statement. What a hero. BBC Sport NI's Richard Petrie: "Windsor Park is rocking again as Euro qualification is surely secured now. "Josh Magennis's goal provokes a rendition of the 'bouncy' and the fans are in full voice." "Josh Magennis has repaid Michael O'Neill's faith in him tonight. Unbelievable. Who would have thought it? "Magennis has been a constant thorn in the side of the Greek defence tonight and deserves his goal." Back under way in Belfast, bang on the button. Rory McIlroy's mostly well known for being brilliant at golf, but as it turns out he's not bad at reading the future as well. Germany bossed the first half but were disappointing in the final third. Dare I say they are lacking a proper centre-forward? I'm sure I said that during the World Cup and that worked out OK.
Stephen Kennedy: The guy sitting beside me went for a burger and missed the Steven Davis goal. All I could say was: "Hope you enjoy that." Worth repeating the fact that as it stands, Scotland are out, thanks to the Republic's point at home to the world champions. "The second half takes on a completely different look after that stunning Matt Ritchie strike. Poland had been in complete control with the home side creating very little. The question is, will the Scotland goal do to Poland what the visitors goal did for Scotland? Gordon Strachan sticks plan B back in the drawer and now looks ahead to the second half." "For the first 25 minutes I thought Scotland were basically out. They couldn't even get near Poland, they looked second best in every position but slowly and surely they've come into the match again and got better and better without ever really taking control. "And the one opportunity they have had, it wasn't even a half chance. Matt Ritchie was 25 yards out and facing the wrong way but he absolutely leathered it home." Still playing in Dublin, where Shay Given has been replaced by Darren Randolph of West Ham. Pick that one out! What a hit!Matt Ritchiedrags Scotland's chances of qualifying back into the realms of possibility with an absolute belter. One touch to set, and then a left-foot drive from 25 yards out into the top corner! David G: Is this seriously going to happen?? 30 years in the making. sf-copy: Everyone talks about Wales's achievement in this campaign but Northern Ireland's is much more impressive. What an escape! Greece have one shot blocked in the goalmouth and then seconds later Kostas Mitroglou rattles a shot against the inside of the post. Germany piece together a neat, flowing move down the right but when it is cut back to Mesut Ozil on the edge of the area he can only shoot into the side-netting. Shay Given is struggling now though. "We're now in the last few minutes of the half and Northern Ireland just need to take the sting out of the game. Run the clock down. "Greece have been knocking the ball around well and I'd like to see the home side get their passing game back going again." It's not going to be all plain sailing for the hosts as Kostas Mitroglou threatens to convert a fine cross at the far post but that man Steven Davis is back in his own box this time to hook it out. Germany make an early change as Bayern Munich forward Mario Gotze limps off to be replaced by Wolfsburg's former Chelsea man Andre Schurrle. Guile replaced by pace. For all of Germany's play, they have yet to have a shot on target. Prior to this week, Northern Ireland goalscorer Steven Davis last found the net in February 2014, for Southampton in a 2-2 draw with Stoke. He now has two in a week after notching in Saints' 3-1 win at Chelsea on Saturday. Northern Ireland potentially just 50 minutes of playing time away from a place in the Euro 2016 finals. What a night. Windsor Park genuinely bouncing now. Great atmosphere. "Stuart Dallas made sure he got the ball in the six-yard box and who was there for Northern Ireland? Captain Fantastic, Steven Davis. And what a ball from Corry Evans, too. "Northern Ireland just need to keep the momentum now." Michael McGovern in the Northern Ireland goal does really well to come off his line and punch a dangerous cross away. Greece threatening. Northern Ireland - are heading to France. This is because the Faroe Islands are winning in Hungary. Republic of Ireland - are assured of a play-off place. This is because Poland are winning in Scotland. "Scotland have to open it up and get it wide, they have to score now or their qualification hopes are ended. The last five or 10 minutes have been a lot better, but Poland are looking very dangerous on the break." "It's been good positive play from the lads. As long as they keep pushing up the pitch looking for the ball off Josh Magennis, Northern Ireland will continue to cause problems. "There are big question marks around the Greece defence. Sooner or later they'll make a mistake, so the home side have to keep the pressure high." Gordon Strachan wears the look of a man trying to solve a quadratic equation. or trying to remember if he locked the back door. Problems. "Scotland push and probe, left and right but every attack simply crashes against the Polish defensive wall. Gordon Strachan's side need to find an extra gear because the visitors look very comfortable at the moment." Follow the Scotland game here. The best bit of play all night for Northern Ireland! Stuart Dallas drives at the Greek defence and his low cross is hastily swiped at by a white shirt. Josh Magennis reacts well to power in a drive but Vangelis Moras makes a superb block. Electric, you could say. Mesut Ozil possibly touches in a lovely low Thomas Muller cross - but the Arsenal man had strayed a yard or two offside. Reprieve for the hosts. Even if he didn't, he was directly obstructing the keeper's view, very much interfering with play. The George Best, 'Spirit in the Sky' chant gets a strong rendition around Windsor Park as the hosts continue to press hard. There is a lack of quality and conviction up front though. Josh Magennis is a game lone striker but his touch and awareness are lacking so far. They can't keep hold of it. Poland continue to look so dangerous on the break. Scotland in a mess. Ilkay Gundogan has a shot deflected just over the crossbar as Germany continue their utter dominance. A goal for the men in white looks a matter of time. Former Northern Ireland defender John O'Neill on BBC Radio Ulster: "Northern Ireland don't have to go gung-ho. If the Greeks want to play the game at a slower pace we can afford to bide our time." The Faroe Islands have just gone ahead against Hungary, meaning that as it stands, whatever happens at Windsor Park tonight, Northern Ireland will have qualified for next summer's Euro 2016 finals. A sentence to go with our 'I never thought...' theme. "The Poles have conceded just seven goals in eight games so far in group D and might fancy their chances of defending this lead. They continue to press though as the Scotland players struggle to get a foot hold in this game." "Northern Ireland are letting Greece play the ball around the back but as soon as it reaches midfield the pressure is on from Steven Davis and Stuart Dallas. "It's important they keep it nice and calm. Even though they're closing the ball down well, the home side don't want a rush of blood to the head when they're in possession." Germany have started, well, like world champions. Stroking the ball about like they own it. Marco Reus has a shot blocked before Jerome Boateng heads over. As things stand, Scotland cannot qualify for Euro 2016 - but the Republic are assured of a play-off place. The hosts continue their bright start as they look for an opener. Northern Ireland perhaps a goal away from France remember. Will nerves become a factor as the game wears on? Greece - out of it, behind the Faroe Islands, have nothing to play for. Alastair Syme: Not surprised by that, Strachan only picking players who play for higher up clubs, not in-form players. Terrible team choice. "Are Scotland’s play off hopes slipping away after just three minutes?" Follow the Scotland game in full here. "Scotland had decided to play incredibly openly, but unfortunately for them them there is one obviously top quality player on the pitch, and he's just scored. "It looked like Robert Lewandowski was a tiny bit offside, but you couldn't tell with the naked eye." That Poland goal could be good news for the Republic - and Scotland were actually behind before the game in Dublin had even kicked off! "Northern Ireland have started really strongly, on the front foot. They're in their faces, getting the ball forward early. Greece look indecisive in their back line." Northern Ireland go direct - to good effect. Oliver Norwood flicks the ball on and Josh Magennis is on the hunt. He tries to get the shot away but the text commentator's friend Sokratis Papastathopoulos cuts it out. From the corner, Norwood slices wide. Game on in Belfast - and elsewhere! What has happened - in football, in sport, in life - that you never imagined possible? "Even if Northern Ireland don't qualify for Euro 2016, which, touch wood, is highly unlikely, manager Michael O'Neill will still be offered a new contract. Because he has transformed Northern Irish football so much for the better. "And if they do qualify then they'll be hurriedly trying to get something sorted out, because O'Neill is out of contract in the summer." BBC Sport NI's Richard Petrie: "Northern Ireland supporters crank up the volume inside the stadium on what they hope will be a historic night of celebration in Belfast. "A rapturous reception greets the players as they come onto the pitch. Windsor Park is a sea of green and a cauldron of noise." Tremendous noise, explosive colour from the travelling Poland fans. They want this. Don't forget you can follow that game in full here. Scotland boss Gordon Strachan: "They're the ones, they are ready, the attacking ones have been in great form recently - and that is important because I have had to leave out some very good players. "You won't always get everything right 100% of the time but I picked this team for this game." Dave Plummer: I never thought I'd see York City win 3-0 at Old Trafford. Paul Barnes legend! Paul Cade: I'd never thought Id see my team Wimbledon get to Wembley never mind beating Liverpool on 14/5/88 but I did. In fact, Scotland will face the world's best striker in Robert Lewandowski, according to visiting coach Adam Nawalka. "For me, he is the number one," said Nawalka. "He's the best striker in the world. I know him personally, I know his skills. I can count on him." David Fawkes on Facebook: "Strachan should announce a 12/13 man squad from now on as he seems hell bent on using the same players. Time will come when he complains of a lack of players with international experience - one person to blame for that!" Philip Vass on Facebook: "Wrong keeper and wrong striker disappointing as we have good players but never seem to pick the ones in best form." Poland striker Robert Lewandowski in in good touch. Red-hot form. The Bayern Munich man has scored 12 (twelve) goals in his last four games, including a remarkable five in nine minutes as a sub the other week. Northern Ireland boss Michael O'Neill: "I told them: You're not in control of the result but you are in control of your performance." Chris Martin: Josh Magennis is more likely to play at Euro 2016 than Robin van Persie. Let that sink in. Believe it Adrian, it happened! Richard Atherton, Northwich: I never thought I'd see Louis van Gaal bringing his wine list onto the Old Trafford pitch with his clipboard but I did! Adrian Bennion: My club, little old Fulham, not only qualifying for Europe but making the Europa League final. Utterly unbelievable. "It's 30 years since Northern Ireland qualified for a major tournament, they're playing against a team that is bottom of the group, that hasn't won a game, that's scored just two goals... but we all know they have slipped up in the past against teams of this calibre. "It will be important for Northern Ireland to make it as hostile as they can in the first 20 minutes, attack straight from the whistle." Although we know there will be plenty of moments when we will be defending, we want to be positive and cause Germany problems. I can't be spending every two minutes thinking about what's going on with Scotland but if you could guarantee us a place in the play-offs we would take that. No guarantees Martin. I can't give you one. Tom Haymes: Never thought I'd see Hull City reach an FA Cup final, or qualify for Europe. 10 years previous we were in Div 3. Sunderland's Steven Fletcher will play up front on his own, so there is no starting place for in-form Leigh Griffiths. Bournemouth's Matt Ritchie also starts, but there's no place in the starting XI for Shaun Maloney. Former Scotland captain Willie Miller: "I think Steven Fletcher is the man to start with. I wouldn't have been unhappy if both of them (he and Leigh Griffiths) had played. Matt Ritchie is untried at this level. It's OK playing well for your club. I haven't seen him turn it on in the dark blue jersey so far. Steven Whittaker comes back and gets the nod. I think that is down to Gordon Strachan going for experience. It's going to take a big performance to get the full three points. Everybody is surprised that Shaun Maloney is not starting. He has been the talisman." You can follow a separate live page on the Scotland match here. BBC Sport NI's Richard Petrie at Windsor Park: "The atmosphere is starting to build inside Windsor Park with most fans adopting a mood of cautious optimism ahead of the potentially decisive Group F encounter. "Those supporters who snapped up the extra 1,500 tickets put on sale last week within the space of three minutes will boost the capacity to 11,700 and increase the volume levels as the self-styled 'Green and White Army' attempt to help Michael O'Neill's men across the line." Germany's front four v Ireland's back four is, dare I say, a mismatch. It's Mesut Ozil (Arsenal), Thomas Muller, Mario Gotze (both Bayern Munich) and Marco Reus (Borussia Dortmund) v Cyrus Christie, Richard Keogh (both Derby County), John O'Shea (Sunderland) and Stephen Ward (Burnley). I'm 26 years old and this is the biggest game Northern Ireland have played in my lifetime. For years I have heard stories from my dad about George Best gliding down the wing, kicking the ball out of Gordon Banks' hands, about the famous qualifying successes in 1981 and 1983 and all about the famous victory over Spain at the 1982 World Cup. Tonight at Windsor Park this Northern Ireland side have a chance to give my generation some glory! How can Northern Ireland qualify? Michael O’Neill’s side are currently top of the Group F table on 17 points, but automatic qualification is not yet guaranteed. Win one of their remaining fixtures, and Northern Ireland secure automatic qualification. "I've been watching NI for the last 15 years while working as a BBC summariser and never thought we could make a major tournament. It would be incredible." BBC pundit and former Northern Ireland international John O'Neill never thought he would see his nation in a major finals again - keep the faith John! But we want to know your tales of the unexpected. What has happened - in football, in sport, in life - that you never imagined possible? England walking the Ashes Down Under? Usain Bolt breaking the 200m world record? Wigan winning the FA Cup? Twelve people making scones being the biggest TV show in the country? Let us know. Text us on 81111, with your names please, or tweet us at #bbcfootball. In the words of Barry Davies: "Look at his face! Just look at his face!" If you haven't seen Roy Keane's answer to the above question yet - click here. Keane on Keane gold. Robbie is not starting tonight. Albania could qualify for their first ever major international tournament tonight, but that's just one of several intriguing stories surrounding their home match against Serbia. The reverse fixture in Belgrade in October last year was abandoned after a drone carrying a political message was flown into the stadium, prompting a violent crowd disturbance and a brawl between players in Belgrade. On Thursday as the Serbia team bus arrived in Tirana, stones were thrown and a window was cracked, and tonight there will be 2,000 police officers in attendance, despite the Serbian Football Federation saying no plans have been made for their fans to travel.